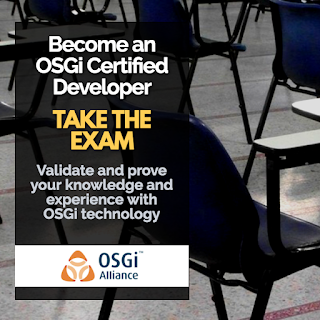 The OSGi Alliance is pleased to announce two dates for the OSGi Developer Certification - Professional Exam this year. London, UK in June and Ludwigsburg, Germany in October. The certification exam provides you with a means to validate your knowledge and experience with OSGi technology and the specifications. The exam is open to everybody (you don't have to be an OSGi Alliance member to participate) however it is recommended that you have a good understanding of OSGi technology and practical experience of using and developing with OSGi. You can find more details about the exam including how to book, topics covered and a comprehensive FAQ on the Exam website. There are also details for contacting us if you have any questions. If anyone has a requests to operate an exam in your locality please contact us via email.